My favorite subject back in first grade was called show and tell. This grade school version of Toastmasters encouraged even the shyest children to get up and talk about something they’d brought from home. Perhaps it was the future retailer in me that made me curious about what the other kids found attractive in the item they stood clutching in the front of the room. I was learning that every object has a story, and that everyone has a different opinion about what they like or don’t like. We used the concept of show and tell as a fun way to get our staff involved at our fall breakfast meeting. While the eggs and biscuits were being prepared, I asked everyone to draw a piece of paper out of a hat. These slips asked the sales associates to go select something in one of four categories: a new item, a best-seller, a personal favorite, or a product that customers often had questions about. They were to keep their selection a secret until their turn. Our participative democracy approach to management (explained in my book, Specialty Shop Retailing) means that almost everyone at the meeting is in charge of a department in the store — so their selections were to come from their area. But there is no reason why you couldn’t let the employees choose from the entire store. A sales agency could also use this approach at a meeting of sales reps to give everyone practice in explaining the key points about the merchandise. There is a definite connection between show and tell — and show and sell. I thought that I was pretty knowledgable about the many lines that we carry at Orange Tree Imports, but even I learned some new features of our products at the meeting. 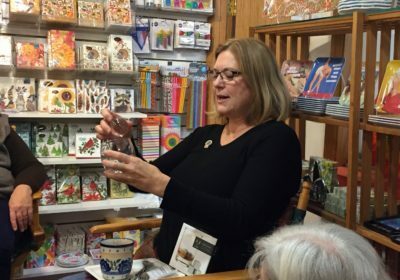 For example, the glass that Joann is demonstrating comes with a mold for making an ice ball to roll around in your glass of whiskey. There is a center “rock” to make the swirling motion go smoothly, and to prevent the whiskey from splashing. Who knew? Now we all do!